Now in the full throes of my ice cream bender, I met my friend for a sugar lunch at Scoop & Crumb, an attractively kitsch fronted independent ice cream parlor in Brighton. 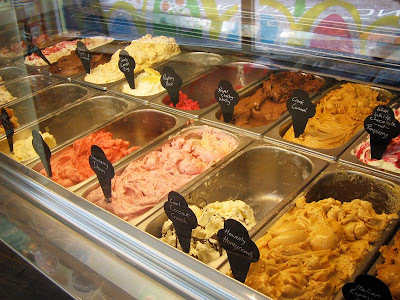 The big whoop is that all the ice cream is made in-house using locally sourced milk. Rock on. As soon as we walked in we were offered a taste of any of the flavours and part of me wanted to go across the whole selection which I am sure they would have let me do. They apparently have the largest ice cream sundae menu in the UK and reading through it takes a good 15 minutes at a scan. One that stood out for me was a Fried Egg sundae, a scoop of orange ice cream floated on a vanilla milkshake! They do mini sundaes for very small children at half a scoop with toppings, a monster of a 12 scoop with all the trimmings and everything in between. Hot, cold, classic splits, floats, shakes... the world is your ice cream oyster. They also have cakes, pastries and some savory open sandwiches thrown in for good measure if the sugar gets too much. My partner in cream had the waffles with a scoop of strawberry ice cream and wild berry sauce and I reluctantly shunned the sundaes for a targeted attack on three specific flavours, choosing a scoop each of rhubarb sorbet, orange and honeycomb ice cream. There was sadly, oh so sadly, no pistachio flavour to compare to Marrocco's or Fusciardi's. The waffle got a huge thumbs up and although my ice creams were good and tasted fresh and natural, they could have had a little more pout flavour-wise but that has not deterred my return. The rhubarb sorbet was my favorite and the sharp fruit refreshingly shone through. 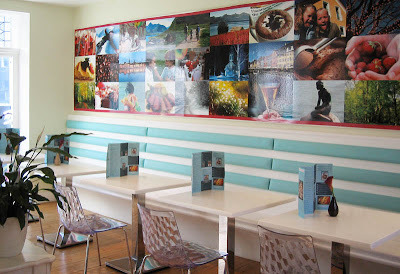 The interior of this place is lovely, largely white with accent colours inspired by ice cream. There is a larger seating area upstairs with huge windows to peer out at the strange and wonderful world of Brighton. During our visit there was a large group of umpa lumpas in the pub opposite, causing havoc in the street below and providing photo opportunities and laughter for the passers by. One of them spotted us and actually came upstairs in Scoop and Crumb to say hello to us and scare the small children. They were celebrating a divorce apparently! Only in Brighton.